So it goes...: "The Book"
Well, the Dirty Shirt bus I'm riding keeps plugging along. There are a ton of things in the works and yet I feel I've still got a bunch more to set up. I'm managing on my own, setting dates, inquiring, and publicizing my book to the various media outlets, but lemme tell ya, it's a full time job, outside of my other full time job. It's a bit all-consuming in the few hours between 5:00 and 10:00 PM. I remember Mike Perry saying that his wife tired of people telling her how funny he was. I think I've approached that point with my wife where I start and end every conversation with something about "the book". She politely nods and says nice things, but I know she's probably tired of it. I don't want to become "that guy" that people avoid for fear of hearing about "the book", so I tend not to mention it to friends unless they bring it up. And if they do, look out. It's hard to shut me up. It's a bit like a woman with her first kid. You have to hear every detail about every burp, hiccup and spit-up. My writing instructor always said releasing a book is like giving birth. I now understand what she means. This one gets all the attention, will get lots of pictures and detail its every review, signing and sales blip. The next one will end up jealous and neglected. Having said all that, and now that I have your attention. (Why, I'm glad you asked!) here's a rundown on what's new with "the book". My radio interview with WUWM 89.7 is rescheduled for this Friday, 7/11. The interviewer had a cold last week, so we pushed it off a week. I am super psyched about this opportunity. Never been on the radio before. I have set up a tentative date to lead a book study group in St. Cloud on December 17th. I connected with a woman from the Stearns County Historical Society and she mentioned the opportunity. I've put together some study questions for the group, so it should be fun. On July 18th I have a joint book signing set up with Allison Brooks Schley outside Martha Merrells during the Friday Night Live event in downtown Waukesha. This should be fun as well. 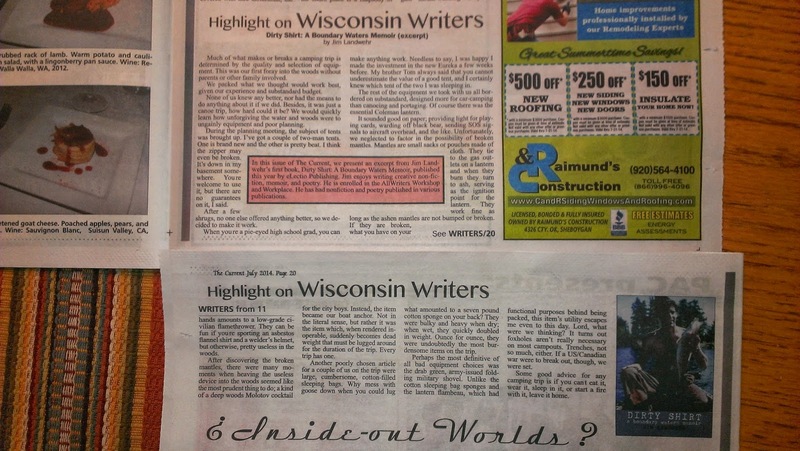 I got a nice plug/excerpt in the Current newspaper based out of the Sheboygan area. This was a result of a chance meeting at the West Bend author event. It's all about connections. I found out that I'll potentially be sitting on two different panels during the Southeastern Wisconsin Festival of Books in September. The first is a "First Time Authors" panel focusing on the many successes of the AllWriters' studio that I frequently attend. The other is a "Writing Across Genres" panel that is exactly what it's titled. Having had some success in poetry, nonfiction and even a bit of fiction, this seems like a good fit. I applied for an Emerging Writers Award from Drake University. It awards a $1000 to a publisher that is a first time author. I thought it would be worth a shot. Fingers crossed. In addition to all of this I want to mention how grateful I am to the many, many people who have told me how much they enjoy the book. It means the world to me when someone says my book made them laugh, cry, or both. That they took the time to buy, read and react to my story makes it all worthwhile. It's what it's all about, is my guess. In my next post, I'll detail some ideas I have for future projects. Like the woman who gave birth and quickly forgot all the pain she endured, I am ready to jump back into the creation stages again. Lord help me if I should start to feel post-partum depression.